The demands of life can be overwhelming at times. Got stress? Carpooling. Deadlines. Soccer practice. Bank statements. Traffic. Dinner. Laundry. The demands of life can be overwhelming at times. As a mom of four, including one child who has Asperger's Syndrome and one who is gluten-free for medical reasons, I'm no stranger to stress. Between managing my son's sensory issues, teaching him how to drive, taking kids to various activities and trying to keep everyone fed, I can feel my jaw and neck muscles tightening as the day progresses. Throw in working part-time and trying to keep a household running, and there are days when I just about reach overload. On crazy days, the mental and physical break of throwing an impromptu dance party can be a life saver. Play your favorite tunes and try out some silly moves in your living room or office (just make sure the door is closed!). Moving your body and singing along is a great way to shake off all that built-up muscle tension. Doodle, paint, crochet or craft. Creating something unique and beautful can relax your mind and your body. One of my favorite ways to de-stress is to art journal (read more here). I enjoy combining photos, writing and artwork to express my thoughts and feelings of the moment, and I have a visual map of where I've been. Connect with nature by hiking through the woods, walking in the park, strolling on the beach or kayaking up a creek. Breathing in the outdoors enables you to leave the everyday world behind and immediately begins the decompression of your built-up stress. Water is a terrific de-stressor. Take a hot bubble bath by candlelight with some soft jazz playing. Or, if you only have a few minutes, soak your feet in some herb-infused warm water. Swimming is another really terrific way to release stress (find an indoor pool for the colder months). The underwater silence combined with the rhythmic arm movements of your strokes can be so soothing. Another quick and easy way to release the stress from your body is to take a few minutes to breathe deeply. Inhale deeply through your nose, then release the breath slowly through your mouth while you count down backwards from five to one. Starting with your head and moving to your toes, consciously relax each muscle group as you breathe. 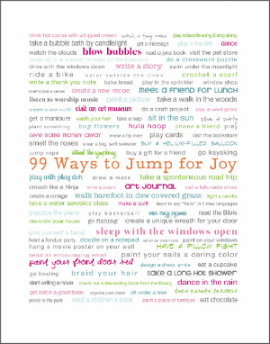 If you'd like more fun ways to de-stress, click here to sign up for my free weekly "Enjoy Life" eNotes and receive my exclusive "99 Ways to Jump For Joy" mini poster for free! Print the mini poster and display it on the fridge or in a frame to remind you to enjoy life more!